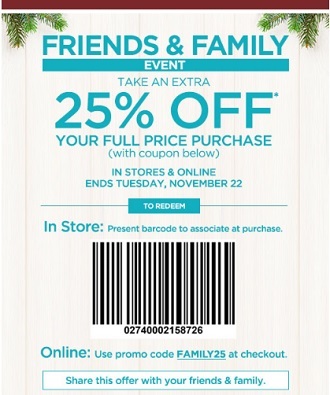 U.S. maurices prepared a special savings for Friends and their Families! You have an unique chance to save 25% off your full price purchase! To receive the offer in-store present barcode to cashier during the time of your purchase. To receive the offer online use FAMILY25 at checkout. You can get your coupon through maurices emailing. For more details visit any U.S. maurices store or maurices online. Source of the information is maurices. The offer is valid until November 22, 2016.